Let the Summer food frenzy begin! It’s an ideal season to shop at your local Farmers’ Market for delicious and nutrient-packed produce. With all the juicy goodness at-hand, here’s a twist on a classic no-cook recipe great for entertaining with friends or hosting a fuss-free meal. 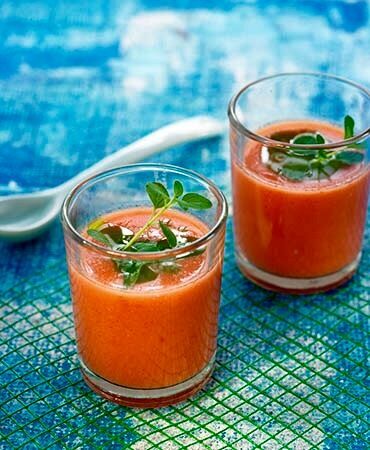 Replenishing, rehydrating and super tasty, our Spicy Watermelon Gazpacho wows crowds of all ages. To boot, watermelon works miracles on the hottest of summer days. Hydrating, cool and refreshingly sweet, this low-calorie fruit is high in vitamin C, vitamin A through beta carotene and lycopene. Cucumbers and their juice are not only tasty, they also serve as a hydrating form of Vitamin C and contain anti-inflammatory properties. Almonds, freshest in mid-summer, are rich in Vitamin E, a good source of protein, minerals and health-promoting fats. It’s a great thickener to this cool soup in place of bread. Jalapenos and hot chiles, in addition to their hot flavor-boosting properties, are revered for a multitude of health benefits from boosting metabolism to curing stomach ailments. Put ‘em all together and Eat the Rainbow. Cheers! Serving Size: 24 shot glasses. Puree in a blender or food processor the watermelon, tomatoes, chile and almonds. Add lime zest, juice and olive oil to mixture. Pulse until well combined. Gently fold in the minced red onion and chopped cucumber. Season with salt and fresh ground pepper to taste.